This is a very common wild species in Brazil. It grows by itself in the wild, but because of it's unique flavor is also widely grown commercially in farms. enough not to scald the plants. some being more domesticaded and selected than others. 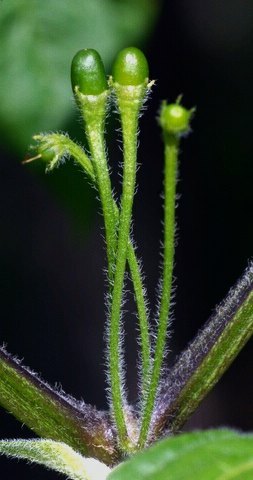 As shown in the two pod pictures above, some varieties are very pubescent while others have no hair and rather waxy leaves and stems. This species belong to the C. baccatum group of plants and is consider one variety of it by some researchers (C. baccatum var. praetermissum). 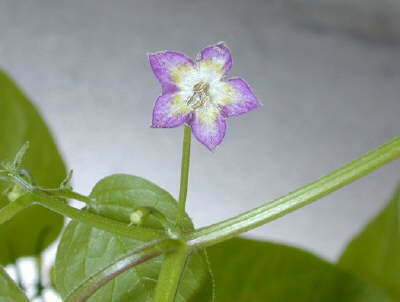 One of the most distinguishing characteristics of this species is its flowers, which have a white corolla with yellow or green spots and a large purple boards around the petals. In some rare cases, the corolla is almost totally white, with just a slight hint of purple (as shown in the picture above). The spots are also sometimes very faint or even, in some rare cases, absent (as in the picture below). 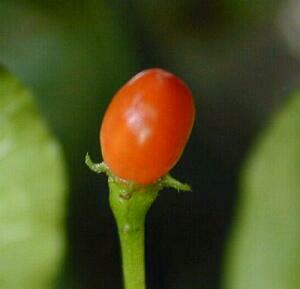 The fruits are usually red (rarely orange or yellow), oblong, erect and, in most cases, deciduous. Some varieties have been selected in order to have less deciduous fruits and are usually the varieties which are cultivated commercially.